One of them many goodness tentacles of The Volta, called They Will Sew The Blue Sail, publishes in bitty bunches (single poem by three poets) monthly, on that day the month kicks into gear. I showed up a tad late this month, disarrayed as is, but was happy happy at what I found. Sandwiched between two great poems by Andrew Joron and Rob Schlegel, Jane Lewty is a bright candle. 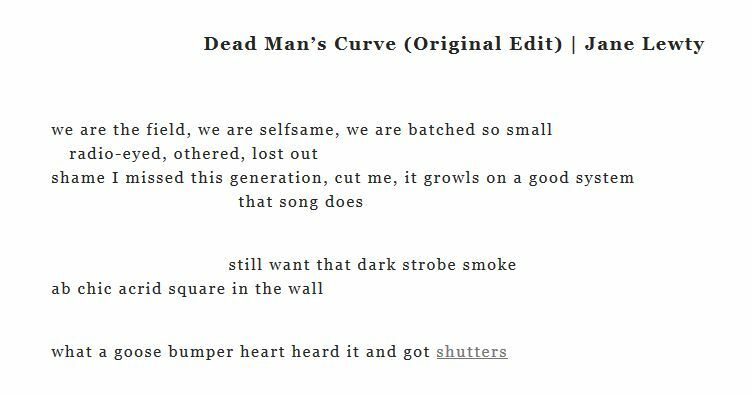 Her poem, “Dead Man’s Curve (Original Edit),” puts us there, fearful and squalling, the “we” together turning over and toppling. There’s an imbalance that this poem paints; it chomps my breath into ripped-apart car-shaped pieces, and I shutter, intensity it is. Go here and see how the rest goes.